The Brockville – 1000 Islands Tackaberry Regional Airport (referred to as the Brockville Airport) is your gateway to four key areas: Eastern Ontario, the City of Brockville, the St. Lawrence River with its world famous 1000 Islands attraction; and the Frontenac Arch Biosphere Reserve, a UNESCO World Biosphere Reserve. The Airport is open 24 hours/day, 7 days/week and is a CANPASS port of entry for Canada Customs. Our Mission: To attract new business to the Brockville region, provide Air Ambulance/ search and rescue facilities while maintaining a public destination facility that reflects well on the locasl community. Located just minutes from the industrial parks of Brockville and Elizabethtown-Kitley Township, the multi-use Airport offers many of the conveniences of a big city airport, without the heavy traffic and high costs usually encountered at these facilities. The Airport offers 1 paved runway capable of handling corporate jets and 1 grass runway (summer only), as well as both GPS instrument and ADF approaches. 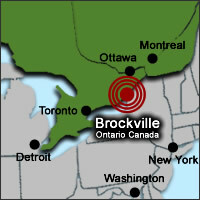 The Airport is owned by the City of Brockville, is managed by the Airport Commission, and is operated under contract by Brock Air Inc. The Airport is also home to the Brockville Flying Club. Whether you are here for business, recreation, education or medical air transport services; would like to rent a hangar or lease Airport land or, possibly, open a flying school, we invite you to take advantage of our facilities and look forward to doing business with you. Weather information is currently not available.